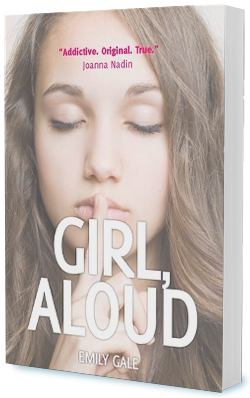 Kindle edition and paperback of Girl, Aloud available. US edition, Girl Out Loud, in hardback. Kass Kennedy is misunderstood. Her dad thinks she wants to be a super-star (no way), her mum thinks Kass can handle her dad (not for much longer) and her best friends think Kass is a two-faced boy-stealer (well…). The only person who gets her is Simon Cowell (in her dreams). In this comical, bittersweet drama, Kass must prove to herself and everyone else that she’s really not that kind of girl. For some thoughts on what inspired me to write Girl, Aloud have a look at YA author Simmone Howell’s blog series, Anatomy of a Novel. Longlisted for the Waterstone’s Children’s Book Award 2009. Shortlisted for the Lincolnshire Young People Book Award 2010. “Girl Aloud has a shocking pink cover with lots of sparkle but I should know by now not to judge a book by its cover. This is a great story about Kass Kennedy whose father is desperate to have her perform on X Factor in front of Simon Cowell, despite the fact that she can’t sing, doesn’t want to do it and is terrified at the thought. She also has a brother who is fast becoming a local crim and a mother who doesn’t ever seem to be in the moment. To add to the mix there is a rather handsome masculine Cass hanging around who definitely wants to get to know her better.